The planned port expansion would be built at Bayport Channel (lower part of map above), located some 30 miles (48 kilometers) southeast of downtown Houston. Now, after five fractious years of debate, the 1,100-acre (440-hectare) design has hit another snag. The U.S. Army Corps of Engineers (www.usace.army.mil) has once more delayed its permit decision on the expansion, which had been expected this time around on Oct. 17. Initially, the Corps' rule was scheduled to come in July. The agency, though, has continually postponed its decision. That, in turn, reflects the scale of the dispute  as well as the expansion. The epicenter for the planned expansion is Bayport Channel, located some 30 miles (48 kilometers) southeast of downtown Houston. That's where the Port of Houston Authority (PHA) wants to build the new container terminal that's essential, it says, to handle the area's burgeoning volume of waterborne traffic. Houston's existing Barbours Cut terminal (pictured) ranks No. 1 among U.S. ports in foreign waterborne commerce and No. 2 in total cargo volume. Houston's hefty volume isn't at issue. The existing Fentress Bracewell Barbours Cut Container Terminal at the Houston Ship Channel ranks No. 1 among U.S. ports in foreign waterborne commerce and No. 2 in total cargo volume. The facility handles more than 50 percent of the Gulf of Mexico's container cargo and 80 percent of Texas'. Barbours Cut Terminal volume is so high that workers must relocate containers at night to provide sufficient room for the containers arriving in the morning. Expansion backers contend that thousands of jobs and billions of dollars in economic impact hinge on the Bayport terminal, which would hold 1.4 million containers at full capacity. "When you combine environmentally responsible operations with almost 12,000 new [direct] jobs in the first 10 years, over $1 billion in new business and more than $40 million in new taxes each year, the facts are clear: The Bayport Container Terminal should be built and brought into operation as soon as possible," PHA Chairman James T. Edmonds has asserted. The Barbours Cut Terminal has been a tremendous site-selection draw. Since its approval by Harris County voters in 1971, the PHA's operation has attracted a reported $17 billion worth of investment in manufacturing and processing facilities along the Houston Ship Channel. A small but vocal group of expansion opponents, however, sharply differ on the plan's environmental credentials. Similarly, they question whether Harris County's Bayport is the appropriate site for a new Houston-area terminal. 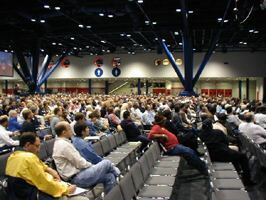 "We are absolutely dumbfounded as to why the Port of Houston continues to insist that the Bayport site is where they're going to have their future port for container traffic," contended Jim Blackburn, an attorney with Houston-based Blackburn Carter who represents the Galveston Bay Conservation and Preservation Association (GBCPA at www.gbcpa.net). "It should be at the lower portion of the bay, where it will do less harm." Thousands of residents have turned out for Bayport expansion meeting, including the crow above at a permitting hearing. Predictably, the battle bled over into the courtroom. The group is suing the Corps of Engineers, which is responsible for processing the PHA's building permit application. Released in May, the Corps' final environmental impact statement (EIS) on the port expansion is deficient, the plaintiffs allege, including major violations of the National Environmental Policy Act and the Clean Water Act. The federal District Court, the suit contends, should order the Corps to prepare a supplemental EIS. "After five years of fighting this project, we have only now been told that air pollution and noise standards will be violated, and that we will experience vibration from ships that could cause problems in our residential community," Shoreacres Mayor Nancy Edmonson said as the suit was filed, charging that the final EIS contained new information. "We have been saying all along that there would be problems, yet only at the very end of this process are we beginning to see the first glimmer of the truth being acknowledged by the federal permitting agency." 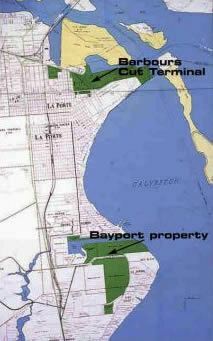 Edmonds responded by characterizing the suit as "another example of the delaying techniques that have been used by opponents of the proposed Bayport project for the last four years." PHA officials contend that their plan sets new national environmental standards for planning and building new terminals. "The Port Authority has drawn on expertise developed in other ports around the world to make the proposed Bayport facility environmentally sound," Edmonds said.  the creation of an additional 200 acres (80 hectares) of inter-tidal marshland through the use of dredged materials. Habitat Preservation Acreage 'a Buyoff"
But one major environmental element in the plan materialized only after an earlier port design drew some high-profile criticism. That "extra" feature is 956 acres (382 hectares) of habitat preservation. The PHA's initial plan only preserved 173 acres (69 hectares) of habitat. That wasn't enough to offset the expansion's environmental impact, said a host of key agencies, including the U.S. Environmental Protection Agency, the U.S. Fish and Wildlife Service, the Texas Commission on Environmental Quality and the Texas Parks and Wildlife Department. The PHA then appended its plan with the additional preservation acreage. Mollified, the four federal and state agencies then approved the project. But not expansion opponents. Shoreacres Mayor Edmonson called the four agencies' approvals "a buyoff." Opponents also pointed out that the preservation isn't in Bayport; 456 acres (182 hectares) are on the lower part of the San Jacinto River, while 500 acres (200 hectares) are on the Katy Prairie. Mitigation, Seabrook Mayor Robin Riley argued, should be in the same area as the port's project. "It gives us about as much good as having mitigation in Wisconsin," he said. Where the expansion's byzantine buildup goes from here remains to be seen. The Corps' ruling on the PHA's building permit is now expected in early November. The agency has three options: issuing the permit, issuing it with required modifications or denying it. But even a permit approval could still possibly be clouded by the pending federal suit. The PHA on Oct. 9 filed to intervene in that suit. "By intervening in the lawsuit," Edmonds explained, "we are seeking to protect the Port Authority's rights and prevent further delays that could significantly harm the region's economy and job base." And another suit from Seabrook is likely if the permit is approved. The city has budgeted $1 million to fight the Bayport project. Such a suit would leave the project in uncharted waters. 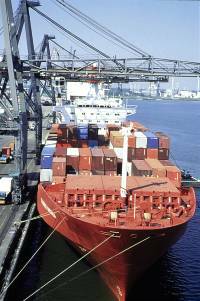 A port permit ruling has never been legally challenged, according to Corps officials. All the while, Bayport critics continue to point out that the Corps' Galveston district office issued a permit in April to Texas City to build a container facility at Shoal Point. The Shoal Point operation, critics note, would handle more container traffic than the PHA's proposed Bayport terminal. All in all, it's a pretty tangled web that's been woven since the PHA won Harris County voters' approval in a 1999 bond election for port improvements. Ultimately, Houston will get an additional port. Its voluminous waterborne traffic demands it. But exactly where the new port is located is the prickly issue that has some locals rolling around as restlessly as the Gulf waters at high tide. Editor's note: For more on corporate facility development in around the Port of Houston, see the Texas Spotlight from Site Selection's September 2003 issue. And for more on similar billion-dollar projects, see our September 2003 cover story, "The 2003 Global Infrastructure Report." Looking for a previous Snapshot story? Check the Archive.